3d text maker, 3d text, 3d text creator, 3d buttontion buttons with ray-traced 3D text complete with shadows and reflections. Design flyers and brochures with high-resolution 3D text. Empower your Web site or software with realistic 3D text. Generate impressive banners or 3D navigation buttons with ray-traced three-dimensional text complete with realistic shadows and reflections. Design flyers and brochures with innovative style with high-resolution 3D text. Insofta 3D Text Commander easily does all that, and more! No complex settings and no learning curve are involved thanks to the visual controls working in real-time. Not sure exactly what you need? Start Insofta 3D Text Commander, and a step-by-step wizard will guide you through the creation and configuration options in less than a minute. Want to create an impressive headline or logo without a lot of design? Just follow the prompts, and you'll have your own unique image with 3D text created on the fly. Insofta 3D Text Commander supports two impressive effects: smooth shadows and reflections. Of course you could create a shadow in Photoshop, but would it be in 3D? Sure you can make a reflection in 3DS Max, but are you prepared to spend days and weeks learning? Insofta 3D Text Commander creates realistic, three-dimensional shadows and reflections with just a few mouse clicks. The effects look stunning, and can be used to create impressive 3D banners or headlines. Have a near-perfect image that's missing that special 'thing'? Adjust the settings by moving sliders, and see your 3D text change in real-time! Insofta 3D Text Commander renders so fast that there's no delay between adjustment and result. Unlike the competition, Insofta 3D Text Commander does not limit your creativity to banner-size images. Create flyers, brochures and other printed matter with hi-quality 3D text on the cover. 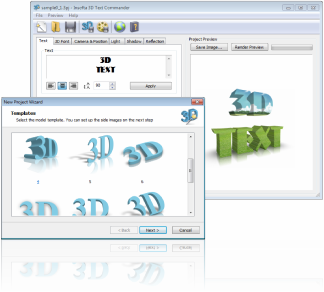 Insofta 3D Text Commander produces images up to 4000x4000 pixels, which is sufficient for printing on letter-size paper in typographic quality. - added saving animation in the SWF, GIF and AVI formats; - added command-line and batch processing mode; - optimized memory usage; - improved compatibility with Windows Vista; - few bugs fixed. e with high-resolution 3D text. Insofta 3D Text Commander easily does all that, and more! No complex settings and no learning curve are involved thanks to the visual controls working in real-time. Sys requirements: Approximately 12 MB of free disk space. No additional system components are required.